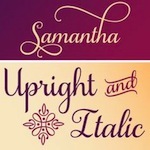 If you’ve been waiting for the lovely Samantha font by Laura Worthington to go on sale, now’s your chance. 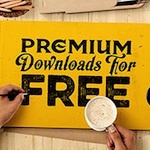 For crafting you want the desktop version and whether you get the Upright or Italic is a matter of personal preference. Each of them come with the full set of alternate characters (the swirls), catchwords and ornaments. If you get the $37 package you also get the bold versions of each. 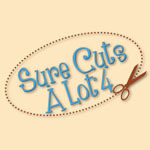 These fonts are also licensed for use on items diecutters typically sell (words and phrases, not individual characters). For licensing details please see Laura’s FAQ’s. 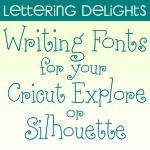 In case you missed it earlier here’s how to use Samantha or other specially coded fonts in Silhouette Studio for Windows. Please see this link for written instructions and a couple of corrections. and for Mac OSX 10.9 Mavericks and Silhouette Studio. The lovely Cantoni Pro featured in the video above is available from Debi Sementelli on Etsy. Gioviale by Laura Worthington is on sale right now at Mighty Deals. 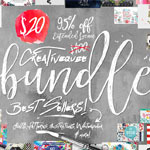 Funkydori by Laura Worthington is also on sale right now at Mighty Deals. How do we locate the ornament and catchwords? They are accessed the same way as alternate characters, and are towards the bottom on the Character Map. 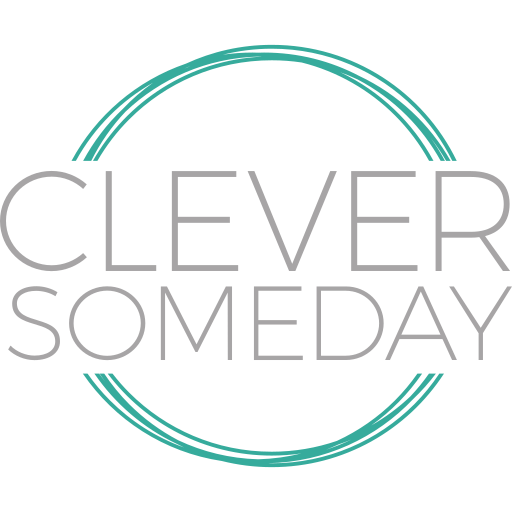 So find the tutorial here that matches your software and follow that to find the ornaments and catchwords. Would love your help! I have a cricut and have been using SCAL2, after all this time I finally broke down and purchased the Samantha family group, I have been trying to figure out how to be able to accesses the other options for letters and the extra glyphs, for about a month now. I have accessed them through my character map, however I am unable to paste them into SCAL2. I have also tried creating it in word, which is successful, however unable to find a way to save it, without distortion, to image import it. Please help if you can, this would definitely be an upset if I’m unable to use it at its highest potential. Sorry Amanda, but there’s no way to paste any text into SCAL2. SCAL4, however, boasts a wonderful glyph palette that makes working with Samantha a breeze. If you upgrade to SCAL 4 you can install both, save as SVG in SCAL4 and still cut with SCAL2. Or use Inkscape to design SVGs as you can paste into that from Character Map. Dang it, thank you though!